Vivian back with a overview of my favorite Disney restaurant, Prime Time Cafe! I love it and I know your kids will too! The prime time cafe is home to many wonderful foods and very strict people. This restaurant is 50’s themed, so when you first go in there will be 50’s decor and TVs playing 50’s show clips. There is also a bar to grab drinks while you wait for your table. When you get, make sure you try the PB and J milkshake! It may sound gross but it is the most heavenly thing you will ever put in your mouth. This drink is one of my families favorites! You can even get it in a to go cup if you want to walk around. When your table is ready they will call your last name, but they say it a unique way. Say your last name was Smith, they would say the Smith kids come on and eat. When you sit down your waiter will tell you to call them aunt, uncle, or cousin. They are very strict here but in a fun way. There rules are but not limited to: no elbows on the table, no tattling and, no arguing. If you are bad you will have to stand in the corner, count sugar packets, or name 101 Disney movies. If you are really bad they might even make you sit with another family! They have all of moms home cooked meals on the menu such as fried chicken, pot pie, steak and more. If you are lucky some tables there have TV’s showing all 50’s shows. After you eat your entree they bring out a set of View Master binoculars, like from Toy Story, with all of the desserts on it. The desserts include a brownie sundae, apple crisp, the famous PB and J Milkshake and more! Over all it is my favorite restaurant at Walt Disney World. 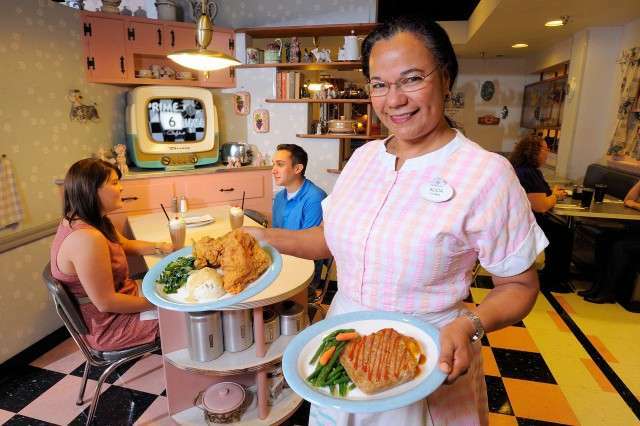 You really need to come and dine here so you can experience the 50’s at Hollywood Studios.